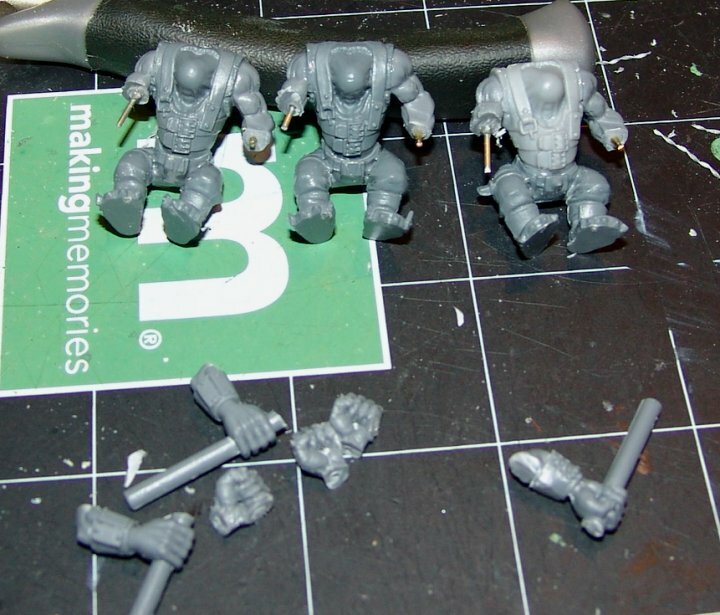 From the Workbench: Da Orksair! The Corsair conversion has begun. Its a 1/48 scale Revel kit, cost me @ $18 at the local Hobby Lobby. Not a horrible kit, but basic and for the novice modeler. This would not be the kit any contest modeller would build (unless he/she was a masochist) due to the raised details and glaringly simplistic fit issues, but considering the horror I'm about to put this kit through (or I should say the horror Oddnutz and his mek crew are going to put it through)... it will serve very well. 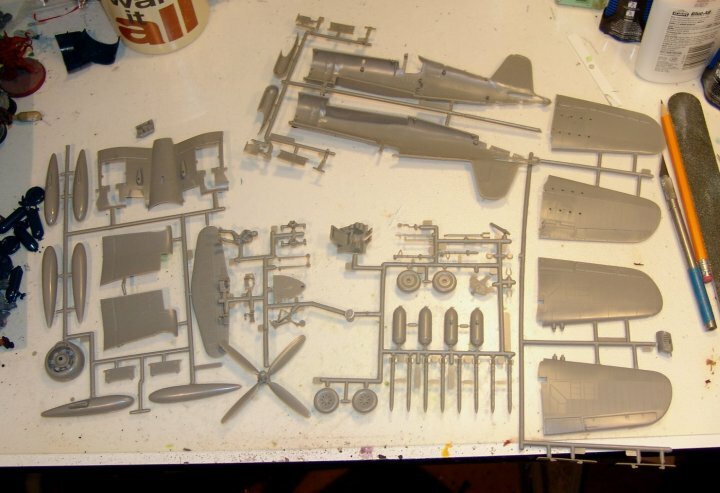 The fun part for me, with kits like this is searching the kit for the copyright date on the mold. Though it looks like this kit was cast in '07 (at least the decals and instructions are from then) the actual mold is from 1963. Older than the Ol' Rednekk himself... and that's sayin' something. The wonderful thing, compared to the Hellcat, is that the plastic is not as brittle as cheap glass. Its as cooperative as any new kit, so there are no excuses on this one down at Da Mekkshop. Before we jump in, a fuselage size comparison of this one and the other fighters that will be converted in the short term. On top, the Corsair. Then the GW Ork Fighta bomba. Then the P47D Razorback. And finally the Japanese Mitsubishi J2M Raiden. 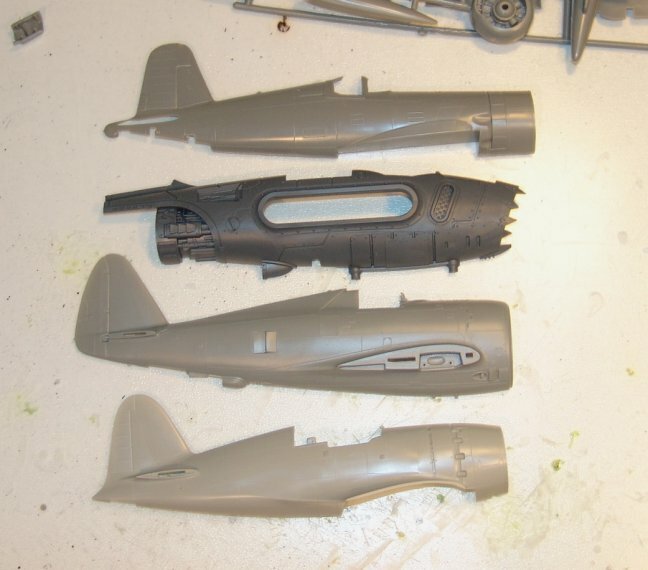 Here's what the Corsair fuselage looks like after some basic cutting. They'll all have a similar take on this profile. Any self respecting aircraft modeller always starts with the cockpit though. 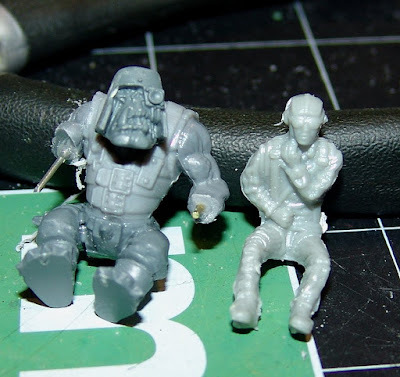 In this case, since its not for a 1/48 scale human and Ork proportions are definitely different, to build the cockpit you have to build the pilot. And since I need 3, time for Doc to snip some legs. Three sets of standing legs cut off around the groin/hip area - because I don't have extra trukk drivers or the like. 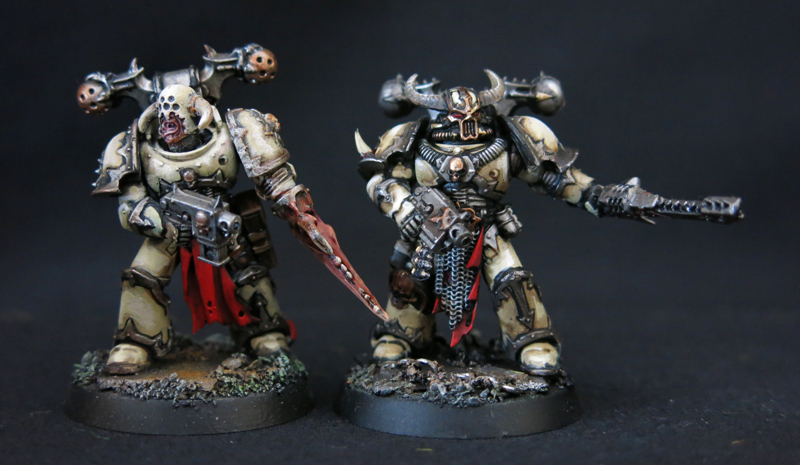 But, its an easy enough conversion, especially since most of the nasty looking bit will be hidden. A bit of clipping and filing and the line up pretty satisfactory for a sitting Ork with his feet on pedals. Adding the torso is a little trickier because of the way it normally fits. I wanted a slight recline, so I fiddled around until I got the right look. I'll be sculpting parachutes/seat cushions and some flight gear looking stuff after they have dries. For the arms I used some fantasy spearman arms. 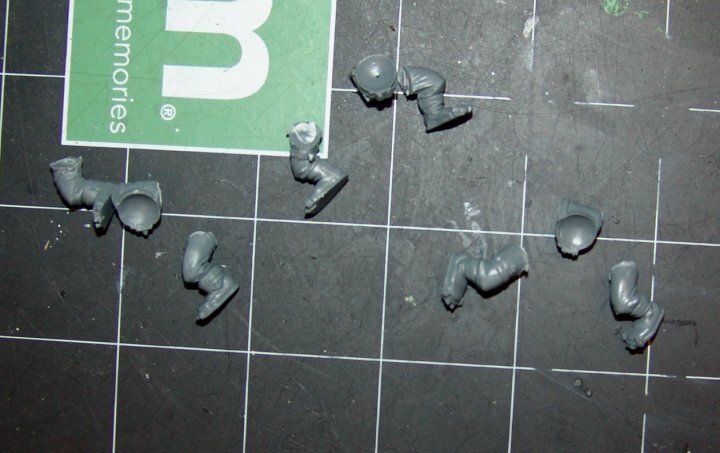 When I first started my Ork army I was under the impression you can never have enough boyz. 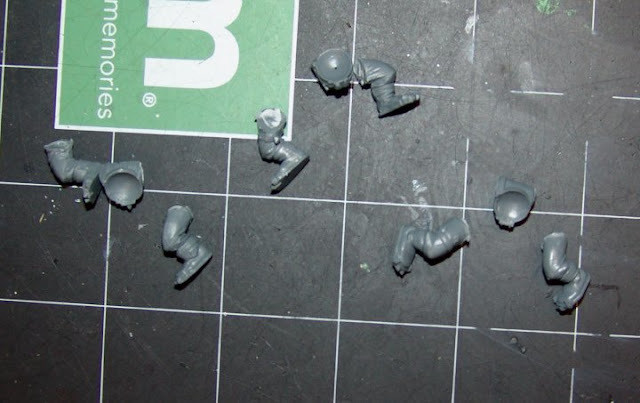 At the time I was working a lot of hours too, so picking up a box here and there ended up swelling the collection and since fantasy ork parts and 40k ork parts were basically interchangable... you get the idea. I used a left arm that had a small knife. Clipped the knife and handle with the goal of having this hand on the throttle. The other arm is a spear arm, which gives me a "grab and go" control stick- with some clipping. The throttle arm needed to be cut at the wrist and the stick arm below the bicep. Once I'm done sculpting the flight gear stuff, I'll attach the arms and resculpt any major muscle groups that need it. For now, that leaves the Ladz in this sorry state. "Oi, wot you seein' da Dok fer, 'umie? Maybe 'e can make you less weedy. Ahur-hur-hur."